I have a 40 page pdf bosch kjet techical manual. if anyone wants a copy PM me your email address. don't post on this thread asking for it, as i'll probably not see it!! i 'borrowed' this from another site. useful diagnostic info for the k-jet system, although the figures may not be correct as it is from a merc site - basically the same system though. Test the fuel pump and pre-pump and do a fuel pressure and volume test. the plate and you should feel no resistance or binding.Also check that the rest height and centering are correct. If the injector does not function,the air-fuel ratio will be lean,preventing easy start up. time switch is defective.Check this in the event that your cold start injector does not function before replacing. Remove the fuel distributor from the airflow sensor and check to see if it moves freely. valve,defective fuel distributor,faulty system pressure regulator and leaking cold start injector. 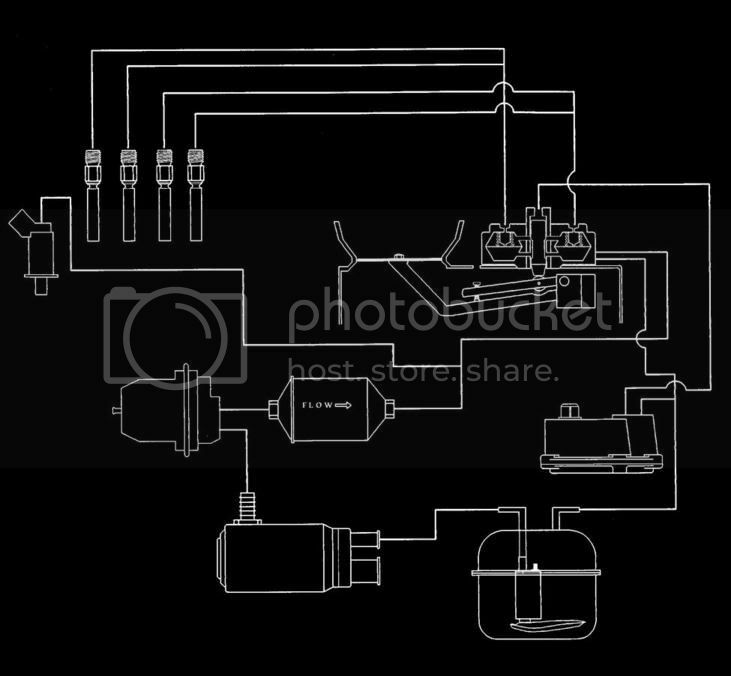 Remove the fuel distributor and ensure that the control plunger moves freely. Remove the injectors from the intake manifold and with the ignition key on/engine off,press on the center plate to pressurize the system.Inspect and replace any injector that is leaking. Cold start injector is dependent of this component. Do a pressure test and verify that the warm control pressure is within spec. The movement of the control plunger will be limited if the cold control pressure is too high.This in turn will limit the amount of fuel able to be delivered through the injectors.The result will be a lean ratio and will cause rough idle. If defective and not opening,idle cannot rise and results in rough idle. If the movement is not smooth,it will result in air-fuel ratio errors. If the cold start injector is leaking,the engine will be overfueled even if cold.If the cold start injector is leaking,the idle will get worse as the engine temperature increases. Do an injector flow test and replace any that do not deliver the correct amount of fuel or have a poor spray pattern. Incorrect warm control pressure that is too high or low will cause an incorrect air-fuel ratio,thus resulting in a rough idle. If the movement is not smooth,it will result in air-fuel ratio errors.Check for centering and correct rest height. Again,will result in overfueling the engine,resulting in a rough idle. deliver the correct amount of fuel or have a poor spray pattern. If too high or low,the air-fuel ratio will be incorrect. Ensure that it is closing. If incorrect,backfire will result if started and under a load. Inspect the cap,rotors,wires and plugs. incorrect control or system pressure and restricted injectors. replace any that are defective. If the control pressure is too high,the control plungers travel will be limited,resulting in a lean running engine. Verify that the spark plugs,wires,cap and rotor are not worn. Do a test for delivery.If an injector is restricted,fuel delivery will be limited,thus power will suffer. If binding or sticking,fuel flow will be limited. If too high,the travel of the plunger will be limited. The plate is not rising to position,continuing to deliver fuel. Do an injector flow test and make sure that they seat correctly.Replace any that are defective. Remove and pressurize the system and replace if it leaks. 1.Pressurize the system by removing the fuel pump relay and use a fused jumper wire with a 16 amp fuse between terminals 7 and 8. 2.There should be a gap of 0.002 inch all the way around the plate.Rest position should be 0.008 inch below the top edge of the narrowest part of the venturi.Free play should be 0.040 inch to 0.080 inch.If this does not occur,adjust until this measurement is achieved. 3200 to 4800 ohms of resistance between terminals 14 and 18 when the airflow sensor is at rest. 560 to 1060 ohms of resistance from terminals 14 and 17. The reading should increase to 3760 to 5640 ohms when the plate is at its lowest point.Adjust until this is achieved.